Cheesy, I know, but I do walk miles every day. 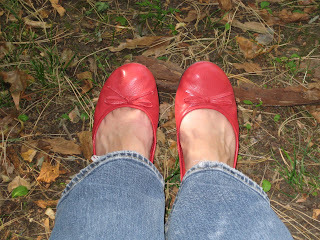 And I love my red shoes. 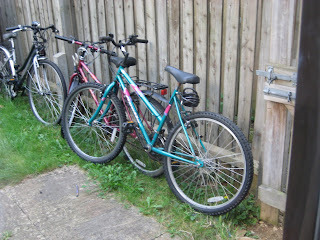 And this is the new bike. I’m half tempted to name her Jade, after Julie’s illustrious car. Isn’t she pretty? Do you click your heels when you walk, my love? she’s beautiful and Jade is a great name!! Welcome to the Yes I Name My Bike club! Oh no! We forgot your birthday! And it was even on the calender. That’s what we get for having multiple calenders. — Happy Birthday from the clan Montgomery.